You are here: Home / Questions of Women & Men / Individuality and Love: Do They Have to Fight? sthetic Realism on a subject that troubles women and men alike, including the loved comedienne Lucille Ball. Most people have a fitful, peevish, incomplete notion of individuality. They associate it with such things as separation, being unbothered, aloofness….True individualism can be described as the affirmation, completing of self through the courageous and just relation of the self with more and more things. The self…is one thing with unending relation. My wanting to have a “just relation…with more and more things,” I learned, was the reason I cared so much for dance and reading. Studying tap and ballet as a girl, and later modern dance and jazz, I felt happy and expressed on the dance floor—affected by the music and my dance partner, trying to be exact as I stepped and moved to the music. I also spent hours reading. I knew my local library as well as I knew my own room. I remember being so stirred by the short stories of Herman Melville, and moved by Henrik Ibsen’s play A Doll’s House. But I had another way of establishing my personality: I would often be cool when other people were excited. I thought that they looked foolish and that I was superior, made of finer stuff. I prided myself on my reputation, among my friends, for making sarcastic remarks to men and “putting them in their place.” Some people considered me quiet and shy; others said I was wild and impulsive; but to myself I often felt mean and ashamed. I learned from Aesthetic Realism that every person is in a fight: Are we going to be an individual through respect for the world, or contempt? Eli Siegel described contempt as the “disposition in every person to think we will be for ourselves by making less of the outside world.” And he showed that contempt cripples our ability to care for anything or anyone, and makes us despise ourselves. I didn’t know that my having contempt was the reason why I felt so unsure of myself, spending hours alone, feeling weighed down and hollow, and why I despaired of ever having love in my life. By age twenty, I felt worn out, pained about love; and I resolved to avoid romantic relationships with men. It was around this time that my roommate introduced me to her friend, Len Bernstein, whose experiences and enthusiasm made me more interested in things, more alive. But I also had fear: I felt that loving a man meant compromising my individuality—giving myself over to another person’s desires and having nothing left of myself. When Len asked me to marry him, I felt two things: joy and panic. I wanted desperately to be of another person’s life, but I felt the permanence of marriage would cage me in. I suggested what I saw as a plausible alternative: that we be married, but that I keep a separate apartment for myself. Thankfully, Len did not agree, and we were married in January 1975. I felt happy waking up to see Len, but in a split second I could go from smiles to irritation, feeling he was in my way. The fact that someone meant so much to me went against the grain, against my feeling I could dismiss people and things whenever I wanted. I looked for ways to have contempt for my husband. Len told me years later that he walked around our apartment as if he were walking on eggshells. The war between liking the world and resenting how it affected me through my husband was raging in me. Arguments and apologies became a daily procedure for us; and, married less than a year, I was unsure about our future together. It was at this time that we had the good fortune to meet and begin studying Aesthetic Realism. To How Many Things Are We Related? I began to be interested in my husband’s relation to other people and things. I thought about the people Len met during the day, things he did, how he felt—and we began talking more. I was having the pleasure of respect! It is the privilege of my life to have studied in classes taught by Eli Siegel, whose scholarship and kindness I respect so much. And I’m grateful to be learning now, in classes taught by Ellen Reiss, how trying to be fair to the world and people is the greatest self-expression. It is a personal victory for me to say I need Len Bernstein to be more myself, and my needing him—his perception, his criticism—makes me happy and stronger. Through my Aesthetic Realism education, I have had more feeling about the world, my husband, and other people with each of our nearly 40 years of marriage. 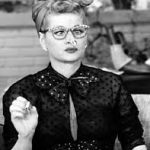 I write now about one of the most loved comediennes—Lucille Ball—whose life comments deeply on the question: How can a woman be her own person as she loves a man? Her life also shows the fight between individuality based on contempt, and individuality based on respect for reality—which makes for art and for true love. It happens that the ability to get away from things is one of the commonest man has: a child gets it early, and uses it a lot. It is quite easy to see the world as something to protect oneself from; and quite easy to find a means of doing so, in becoming aloof, apart. Lucille’s grandfather, Fred Hunt, profoundly affected her life. Taking his grandchildren camping, fishing, on picnics, skating, sledding, he encouraged Lucille and her brother to see things as interesting and worth knowing. “He got us up early,” she relates, “otherwise we might miss something. Sunsets. He loved them and he made us love them.” An active Socialist, Fred Hunt taught his grandchildren to value all types of labor. And very important to Lucille was Fred Hunt’s love for the stage. He took her to local theatres where she was introduced to, and fell in love with, the raucous humor of vaudeville. There sat this man with one light bulb, a little table and a glass of water, creating a whole world out of nothing, making people laugh and cry. It was magic. The whole of acting is a questioning of what is the self; what is individuality? According to Aesthetic Realism, acting shows that you don’t have to be fettered to yourself. Acting is a way of being somebody else for the purpose of coming back home immediately….The self is multiple, and the more exercise it has in being other than itself, the more it comes home refreshed. The girl who had a feeling of being fettered, who was constantly running away and even had to be tied to a rope as a child, likely felt through acting that she was freer, more herself. At age 15, Lucille went to study drama in New York City. Humor, while accepting the uncomely, the awry, the unhandsome, shows that it can be thought of gracefully. When the ugly is seen gracefully, there can be that release familiar to man called laughter. There is no doubt that she had long been a tough character on the set, someone who knows what she wants and always gets it, no matter what. She is wary, watchful and difficult to get close to. I learned that when we use our energy to lessen the meaning of other people, to resent and limit how much the world can affect us, we lessen the life in ourselves. 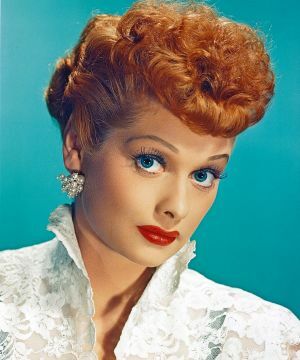 I believe this is why, from the time she was a young woman, and throughout her life, Lucille Ball had bouts of fatigue that left her incapacitated for weeks, sometimes months at a time. In 1940, Lucille met the well-known leader of the Desi Arnaz Orchestra, with whom she was going to appear in a movie. Lucy, who could be stand-offish and aloof, was affected by Desi’s energy and charm. Five months after they met, they married. Two opposing desires in Lucille were battling: she felt her husband meant something big to her, and she was also furious that he did. Friends commented how the couple was tumultuously for and against each other, constantly fighting and making up. After four years of marriage, Lucille filed for divorce but never followed through. It seems her desire to manage her husband was consuming. She told him how to dress, how to talk, and, write Morella and Epstein in Forever Lucy, she “wanted [Desi] to act in a more refined and dignified manner.” They thought that perhaps working together would save their marriage. Hence, “I Love Lucy” was born. From 1951 to 1957, in 180 half-hour episodes, they appeared in front of millions of people as Lucy and Ricky Ricardo, sometimes incorporating their arguments into their TV scripts. But the arguments they gave comic form to on camera, they suffered from in their marriage off camera, because they had a different purpose then—to own and manage each other. 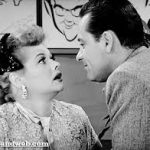 Growing up, I remember watching and laughing, along with much of America, at the antics of Lucy Ricardo on “I Love Lucy.” Decades later, it is still popular. And I was surprised to see that the premise of each show is that individuality and love have to fight. Lucy Ricardo is a housewife who tries asserting her individuality through all kinds of plots and schemes to get what she wants. From buying new furniture without telling her husband, to aspiring to be in show business, she connives and wheedles her way into one scrape after another, inevitably gets caught, and has to get herself out of trouble. An episode I love takes place in California when Lucy goes “movie-star hunting” in the famous Brown Derby restaurant. She spots the actor William Holden and, overcome, blatantly stares as he is trying to eat. He decides to turn the tables and begins staring back. She gets so u ncomfortable that she rushes out of the restaurant, but not before bumping into a waiter who spills a tray of desserts all over William Holden. Later that day, husband Ricky surprises his wife by bringing home a famous movie star for her to meet—yes, William Holden! In a panic she disguises herself—covering her red hair with a kerchief, putting on glasses, and donning an outrageous putty nose. While both men are startled by her appearance, everyone tries to act nonchalant. When William Holden lights Lucy’s cigarette, something unplanned happens – he sets her putty nose on fire. Without missing a beat, Lucy, with great aplomb, calmly reaches for the coffee cup before her, dips the false nose into it, quenching the flame, and the show goes on. The oneness of abandon and control made this one of the funniest and most memorable scenes ever. As actors and producers of “I Love Lucy,” Lucille Ball and Desi Arnaz worked together to create a more artful way of filming television shows, which until then used only one camera. They introduced the use of three cameras that for the first time allowed viewers at home to see the action as it unfolded from different points of view. They also introduced the innovative practice of taping live shows so they could be viewed again – what we know as “re-runs”—and one result of this was well-deserved residual pay for actors. Once we got on the set,…there was so much enthusiasm among our company that I could forget the silent, strained weekends, Desi’s departures from home, the threats to his health….I never worried about my work. I worried as a woman. On their sixteenth wedding anniversary, they were both invited to speak at a seminar for brides. Her pain is evident as Lucille “warned the ladies not to try and change their mates. ‘They never change,’ she said. ‘You just get more tolerant and more tolerant,’ she added with a resigned grin.” Their 19-year marriage ended bitterly and, though both later married other people, Desi continued sending Lucy flowers on the anniversary of their own marriage. She declared in more than one interview that he was the big love of her life. The privilege and opportunity to know ourselves, to become real individuals, is in the beautiful education of Aesthetic Realism, and what people everywhere deserve!